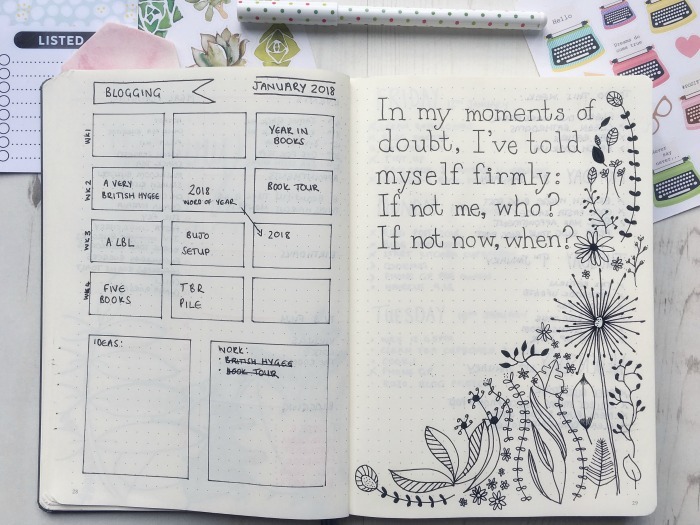 It’s taken me a while to move into my second Bullet Journal; I didn’t use my old one much in the run up to Christmas and even though I had about twenty pages left I decided to start the new year with a new journal. I filled up my old journal with a few notes here and there and used it to plan what I was going to keep in the new one. I know we’re a few months into the year now but I’ve just gotten round to taking a few photos of how I’ve set it up for 2018 so I thought I’d share what’s new, what I’ve kept and what I’ve ditched. I went right back to the start and flicked through making a note of the pages I used the most as well as the ones I don’t need anymore. I then browsed through my Pinterest board and made a list of pages I’d like to add in right away and others that I can add when I have the time and inclination. I’ve put a full calendar spread right at the front and a future log just for keeping track of dates, school holidays etc. 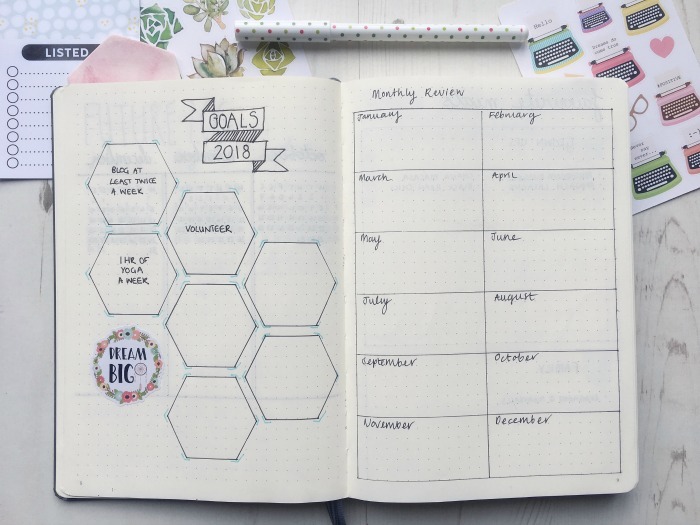 I’m not usually one for goals but I’ve put a goals page in this year just to try and push myself a little more. 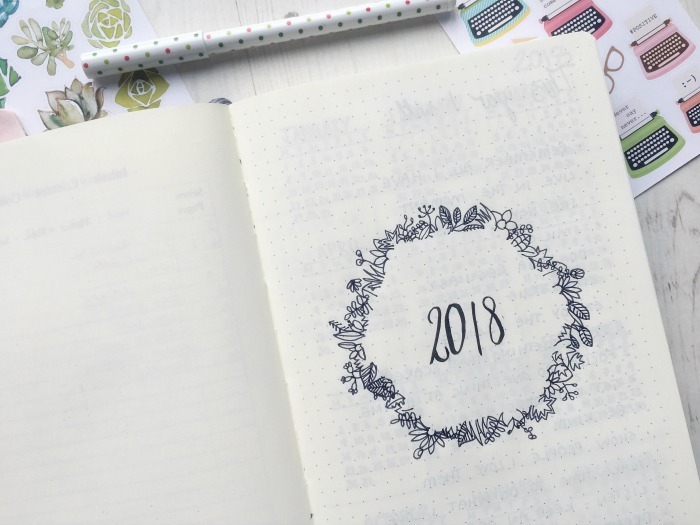 You’ll notice that they are fairly simple ones one there at the moment but I’m not a big believer in starting something big 1st January – it’s not the best time of year to keep yourself motivated. I’m hoping to set a few more as the year goes on! I used my old journal to work through these questions for my word of the year and popped it on a spare page in my new journal. 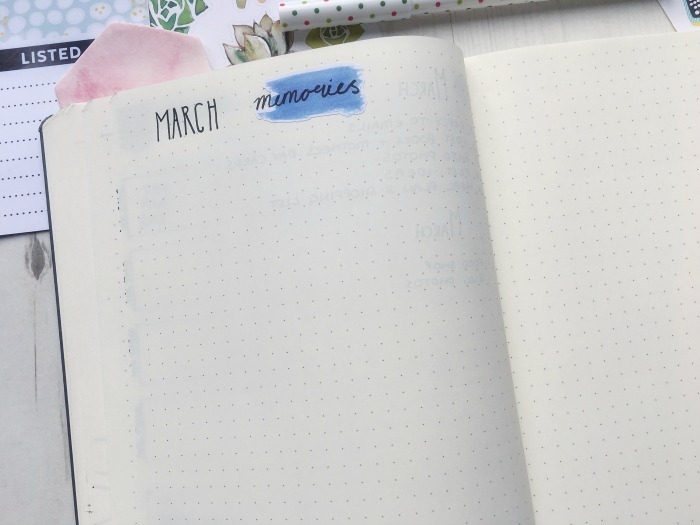 One of the few ongoing lists I’ve kept from my old journal are my book pages – I do love looking back on them and I still get so much satisfaction from having lists on paper rather than all online. 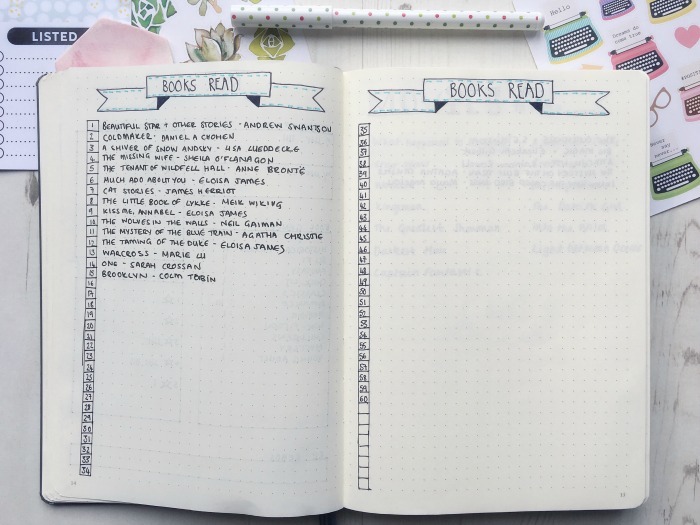 I use the books to read and movies list when I’m reading other blogs and see what people recommend. 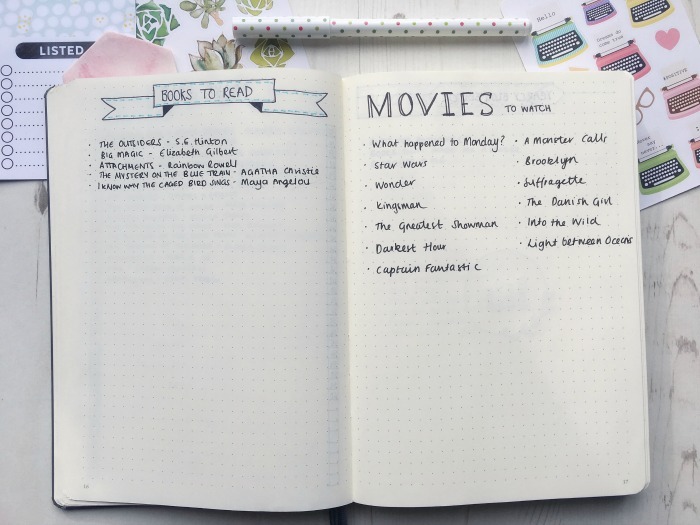 I have the worst memory so I try to write it down anything I’d like to read or watch here. I started a projects page at the end of last year and decided to keep it in. 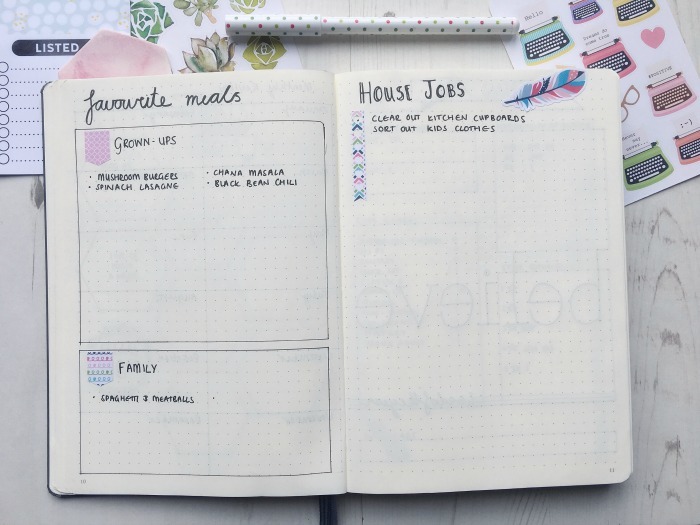 I still haven’t managed to get on top of a proper master grocery list but I’ve started a list of favourite meals for when I’m doing the shopping list each week. The house jobs list is something I just had scrawled at the back of my old journal so I’ve added it in here to help me keep on top if it. 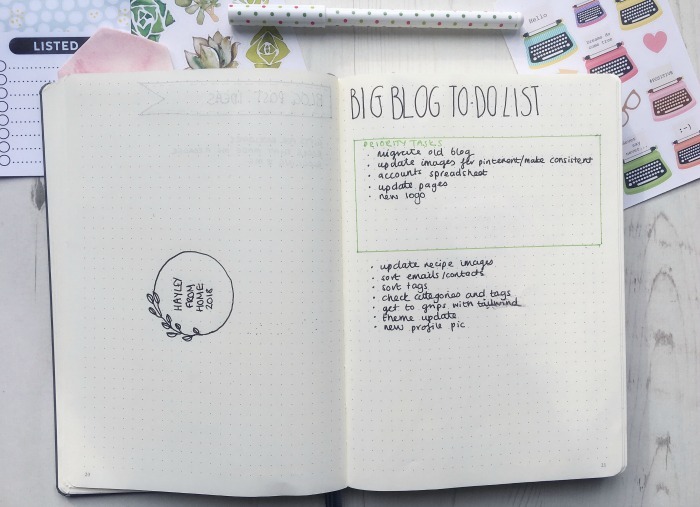 I’ve kept my blogging pages the same and I’ll use them to jot down ideas and ongoing jobs over the year. 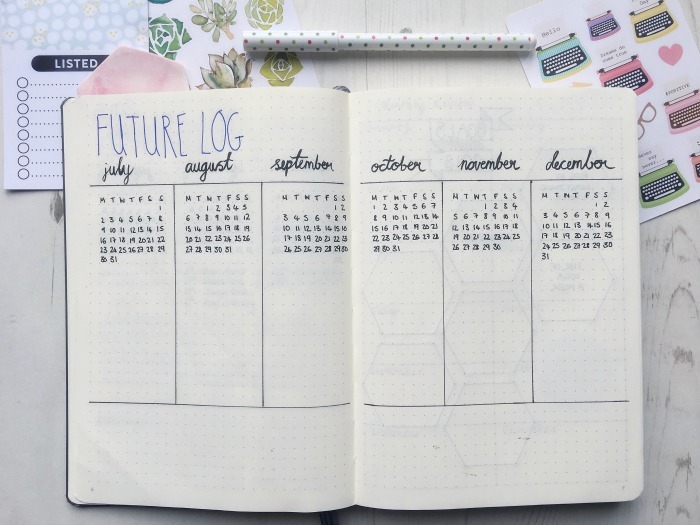 I also keep a monthly blogging calendar which is meant to help me post more regularly! I’ve kept my monthly setup the same simple one I’ve used for a while now. 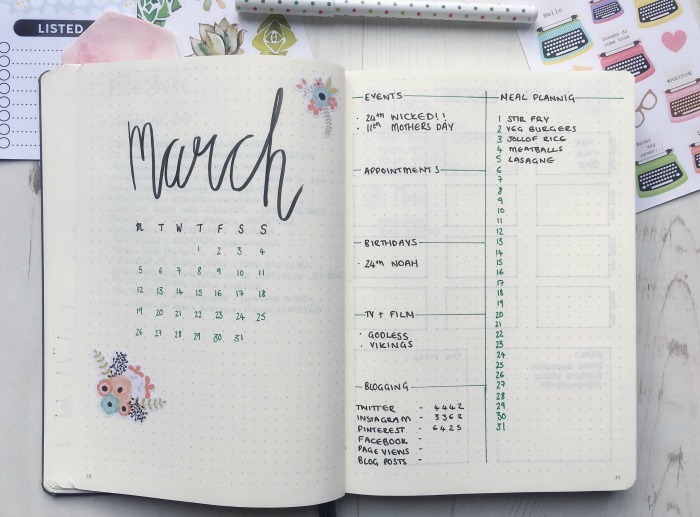 Each month I use the same layout, this helps me keep track of appointments, birthdays, meals etc. 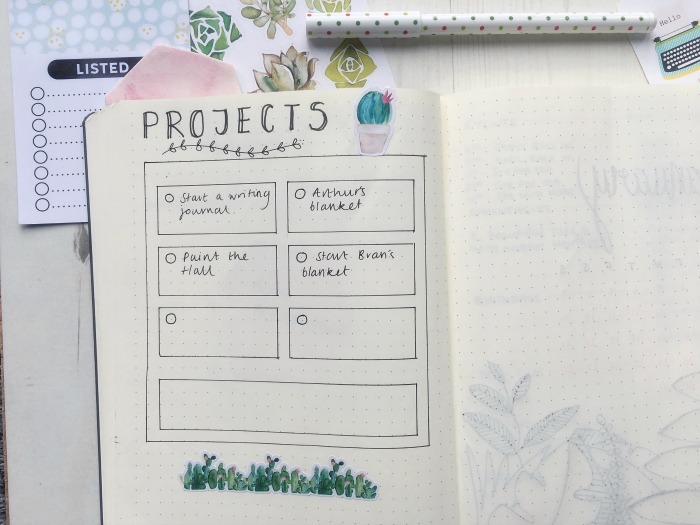 I follow it up with a memories page, blogging calendar and daily lists as and when I need them. Not every day needs a list but when I’ve got a lot on my mind and I feel like things are getting on top of my they help me prioritise. I’ve added a list in the back of a few more pages I’d like to add given the time. I’ve spotted a lot of these on Pinterest which is such a great place to look when I’m feeling low on inspiration. 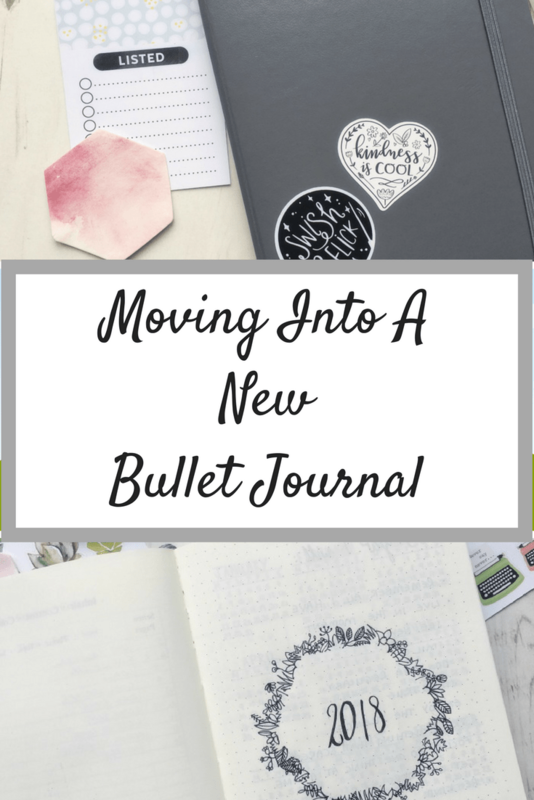 I’ve stocked up on a few new bullet journal supplies from my wish list a few months ago. The lovely stickers you can see in my photos are from Paper Robin Books they very kindly sent me a few of their gorgeous planner stickers from their Etsy shop – I absolutely love them! My favourites are the cute succulents and typewriters as well as the quote wreaths. They have lovely illustrations for decorating pages as well as banners and watercolour spots that you can write over the top of. 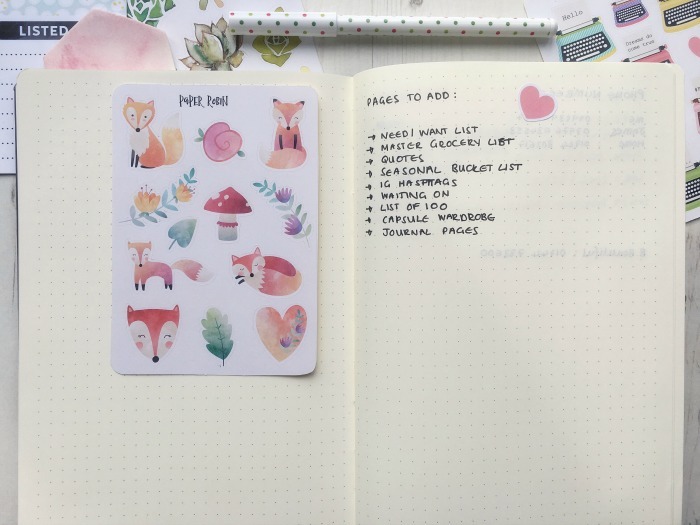 I bought the stickers on the front of my journal from Nutmeg and Arlo, something different for this year. I’ve stuck with my trusty Leuchtturm 1917 with dotted paper in Anthracite. I use a few different pens but my favourites are Fabel Castell Pen (size small) for pretty much all the writing and grids, Pigma Micron for doodling and the Tombow Fedenoseke for lettering. I also have these Staedtler Triplus Fineliners for colour. I’ve kept the initial set up as simple as possible for now but I’m looking forward to adding more in as the year goes on. 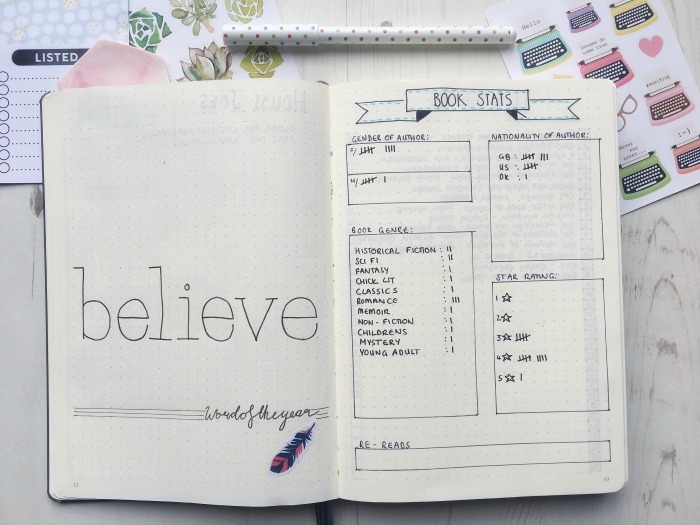 I am new to Pinterest and I stumbled into your beautiful journal work. I am so inspired! Question: Were you a teacher in a past life? I wish you had been mine! Like second grade or high school. 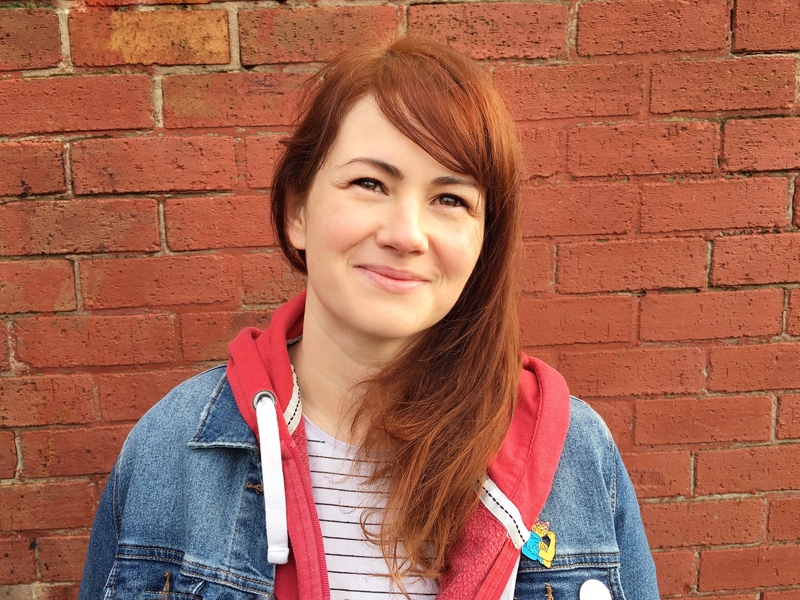 You make writing fun AND real!